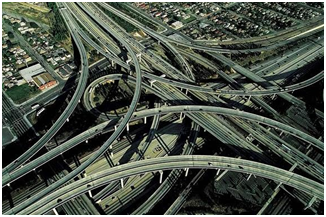 Imagine a road network such as the one illustrated here. This system becomes more complex as new roads are built. In order to be useful for users, the system requires maps (i.e. models). Otherwise, its value decreases since users are not able to know how to reach their destinations from their source points (unless they have indeterminate time to experiment without taking care about efficiency). The same happens in information systems. Any activity aimed at adding value by improving the system’s quality (testing, maintenance, evolution, process reengineering, etc.) requires knowing the functional requirements of the system. This is the reason why structured thinking and analysis are key skills in software engineering. In contexts in which there is no documentation on such requirements or it is not available, structured thinking is even more critical, especially when reverse engineering needs to be performed. Conceptual modeling is an essential technique to support knowledge management. Take a look around. In many technical and scientific areas, humans usually use models to structure thinking: We use maps (i.e. models) when we travel abroad; we cannot imagine constructing a building without blueprints and plans (i.e. models); scientists are trying to find out the map (i.e. the model) of the human genome; weathermen simulate (i.e. they model) the expected weather behavior; industrial processes are modeled and automated to guarantee quality results, etc. As testers we also need to continuously managing knowledge about the functional requirements of a system. As we perform testing activities, we continuously think about implicit models of the expected behavior, although sometimes these models only persist (for some time) in our minds. Otherwise, we would not be able to perform quality testing, because we need to know what behavior needs to be checked. And in order to check the behavior, we need to find out what is the expected behavior (i.e the requirements). A particular application of conceptual modeling is the assisted generation of functional models and documentation within the testing process. In Sogeti Spain we are working on this aim since testers use systems by experimentation every day and, by the way, they incrementally find out the functional requirements of the system under test. Generating functional models within the testing process allows to automatically obtain documentation that can be used by project stakeholders (including the testers) because a knowledge repository (continuously validated and evolved) about the system becomes available. The aim is not only performing more testing, but also performing better testing. I simply want to mention I’m new to weblog and truly enjoyed you’re page. Almost certainly I’m planning to bookmark your website . You really come with terrific articles. Thanks for revealing your blog site.